Stand out from the crowd of online stores with a well-developed brand, striking visuals and convenient sales process all provided by the Box WordPress theme, including full support for the premier WordPress ecommerce plugin, WooCommerce. Box's responsive design works beautifully on all types of devices, from tablets to mobile phones, using large fonts and links with well-defined sections for a readable and simple to understand layout that will make buying on your online store easy and satisfying. Throw in extra blog layouts with large images and a varied selection of typography options and you'll be racking up the sales in no time! Page-based frontpage makes matching the demo layout even on an existing WordPress installation easy; takes just a few minutes! Large fonts, buttons and images for a touchscreen-friendly browsing experience; reach your maximum customer base across devices. Clearly-defined frontpage layout utilizing slideshows, images with overlaid text and subtle CSS3 animations for a professional look. Complete product promotion and sales options provided by the fully-supported WooCommerce ecommerce plugin for WordPress. Frontpage product previews with full customization options so you can promote your biggest-selling items and popular items. Blog area with single or two-column text, full-size images in the header and expansive typography settings that bring your text to life. With so much competition in the online store marketplace, it's no longer enough to simply offer a great price or product; for high-level success an instantly-recognizable brand will help your products reach across the world. 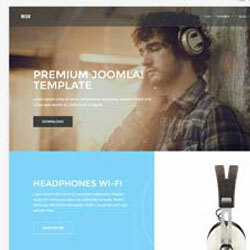 The design of the Box WordPress theme emphasizes your brand's message, with text blocks, big header photos and product slides that can be switched between instantly, bolstered by stylish CSS3 animations, hover animations and slide transitions that lend a professional sheen so your customers know you mean business. If selling is your site's main purpose, then you'll want a complete solution that will allow for effortless management of your inventory, simple product creation, and a seamless purchasing process. Box includes full support for the wildly popular WooCommerce plugin, which offers all these features plus a suite of tools to help your company to grow in profile and success. WooCommerce's superb feature set combines with the exemplary aesthetics in Box to offer concise product pages with photos, information and description sections, as well as product highlights right on the frontpage so the best of your collection can be showcased as soon as the customer reaches your site. Internet-enabled mobile phones and tablets are now ubiquitous in the online space, so you'll want a theme that offers mobile users a comfortable browsing experience if you want to market your products to the widest possible market. Box uses large fonts and starkly-separated sections along with huge images and buttons so that even on a small touchscreen your customers will be able to complete a purchase with ease. And of course, everything is fully-responsive so your site will fit to any screen size. Don't throw away a golden opportunity; make a website that appeals to all users on every kind of device. Sometimes matching the demo layout of a theme you've bought is an exercise in frustration; widgets are complex or lack options, text you input doesn't match the example, or things just don't fit together the way you expected. Our unique page-based frontpage layout simplifies the process of matching the demo so much that it takes just a few minutes, even when installing on an existing WordPress site, so you'll be free to repurpose and modify the demo content to suit your needs, no fuss, no frustration. Your products and frontpage will go a long way to getting noticed, but to add extra weight and nuance to your branding then well-written articles that target your core demographics will solidify your company's connections to your customers. Take advantage of Box's clean yet attractive blog pages that come with a range of typographical options to diversify your text and images. Use multiple image sizes, quote blocks, two-column newspaper-style text layouts and a range of bullet points, ordered lists and highlights to draw attention to key areas that deserve attention, as well as access to the full set of Font Awesome icons for adding visual cues to important elements. Expand your sales operation and run a successful online store with the style and versatility that Box has to offer!